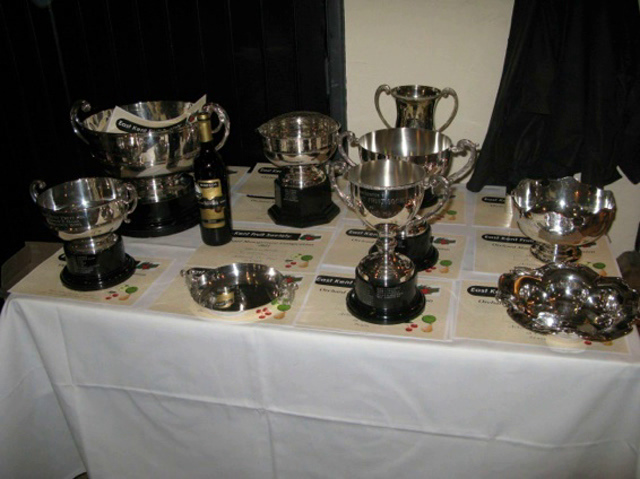 On Tuesday 23rd January, The East Kent Fruit Society held their annual AGM/Dinner and Orchard Competition Prize giving. Always well attended; this year's event attracted 70 Diners; primarily a mix of growers and their personnel, with a sprinkling of fruit industry technical advisors who with their 'expertise' play an integral support in the success of our fruit industry. Carrying away the most silverware on Tuesday on behalf of AC Goatham; Production Manager Piotr Bukowski. It is the second year in succession that AC Goatham have scooped the Overall Best Orchard Trophy. In 2016 a Zari orchard at Shrubbery Farm won and in 2017 the winning orchard was a Zari orchard at Griffins Farm at Sutton Valence. David Hilton was a well respected East Kent fruit grower, A tireless supporter of the UK fruit industry and of the East Kent Fruit Society. He gave a large amount of time and energy back to the industry and was one of Kent fruit growing's unsung heroes. This year's recipient is Sandys Dawes who grows apples, pears, and cherries with his son Will now managing the business. Presenting Sandys with his David Hilton Medal, neighbour and good friend Henry Bryant. Henry recounted some stories of their travels together, searching for better cherry varieties and more productive rootstocks. He reminded the audience that Sandys was one of the first to try bird netting and plastic covers. From those early beginnings Sandys and Will have expanded cherry production at Mount Ephraim; cherries are now the most important crop grown at Mount Ephraim. Responding: Sandys thanked the Society for the award and told the story of how he came to be a fruit grower. On the death of his Great Grandfather (also) Sandys Dawes (the name has alternated each generation from Sandys to William) "On his death his son Willie inherited the estate and it was Willie Dawes who developed the garden, which was to become an absorbing and lifelong interest. When Willie died in 1920, his son Sandys was left with inadequate means to maintain the property. By the time 'that' Sandys Dawes died in 1949 the garden was virtually derelict, the outer reaches so overgrown with weeds as to be impenetrable. In 1950 his son Bill moved into Mount Ephraim with his wife Mary and their four young children. They gradually restored the garden and after Bill retired in 1972 from the shipping company, of which he had also been chairman, he was able to devote more time to the garden. After his death in 1982, the garden was opened to the public"
Fast forward to 1977 and a career change beckoned, Sandys got involved in the farm. In 1982 with the passing of his father, Sandys took over the Mount Ephraim estate. The history of East Kent Fruit Society is a long one; going back more than 90 years..........The Society was formed in 1927 as The Ash and District Fruit Show. In 1937, the title was changed to the East Kent Show which was discontinued in 1969 when the East Kent Fruit Society was formed.